Can these headphones stop you from going deaf? | What Hi-Fi? Can these headphones stop you from going deaf? The Adel Drum headphones have a second membrane between the speaker and your eardrum, reducing the amount of pneumatic pressure and protecting you from hearing loss caused by listening to music. Asius Technologies is crowdfunding a new pair of headphones, the Adel Drum, which are claimed to protect users against hearing loss. 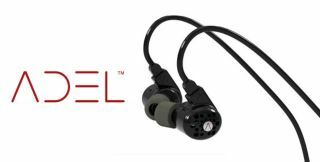 According to the company, conventional earbuds that seal the ear canal can turn sound pressure into pneumatic pressure, which ultimately results in damage to the eardrum. The Adel Drum reduces the pressure through the 'Ambrose Diaphonic Ear Lens', a second membrane between the speaker and the eardrum. On the side of each headphone is an 'ear lens tensioner', which adjusts the level of sound passing through from both the speaker and the environment. Asius says that this will provide an optimal balance and "place the sound where it should be". The type of headphones investors get will depend on the amount pledged - $150 (£120) buys a pair of headphones with moving coil, 10mm speakers and a plastic grill. But for $700 (£570), you get 11mm speakers "with ultra linear, contour field, dual magnet motor", thumbscrew tensioners, a two-pin cord, and grills made of aerospace grade aluminium. For further information, visit the Aled Drum headphones page on Indiegogo.